Who can say No to the goodness of Almonds? With the festive season coming up- we are sure the house is full of celebrations and sweets everywhere! Diwali is celebrated across the country with a host of sweets and savouries prepared at home and distributed among the dear ones. Open any recipe book and you will find pages describing the endless number od recipes you can delight yourself to. And if you have a sweet tooth, don’t worry- this season is all yours! This issue of Good Health, Naturally, we will be focussing on all the goodness of badam as it is popularly known in Indian languages. Almonds are scientifically called as Prunus dulcis and it belongs to the Rosaceae family. Almonds have been one of the oldest discovered fruits in the guise of a nut. In fact, the Bible is known to contain numerous references to them as a substance of value and a symbol of hope. Almonds made their way through the way from Western Asia and Africa into the Western part of the world. The Romans called it the “Greek Nut”. From various sections of the world, almonds slowly crept into California around 1850 and today California is now the largest producer in the world’s supply. Almonds are known to be a rich store house of dietary fibre, fats and protein. The presence of manganese, copper and Riboflavin in almonds helps in energy production and metabolic rate. It is hence suggested as meal time snacks for young kids for energy. Try tossing a few of them in your child’s snack box to give them their daily dose of good health. The presence of two essential nutrients such as riboflavin and L-carnitine are said to stimulate the brain activity and helps in the healthy functioning of the nervous system. The presence of phosphorous in almonds helps in the growth of bones and teeth and regular consumption is known to cure age-related disorders such as osteoporosis. The antioxidants, namely Vitamin E is known to cure illness and the anti-inflammatory properties of almonds help in reducing the presence of bad cholesterol. Due to its presence of various healthy nutrients and minerals, almonds often feature under the category of ‘world’s healthiest foods’. It is often present as a natural ingredient in face scrubs, face wash and other cosmetic products. 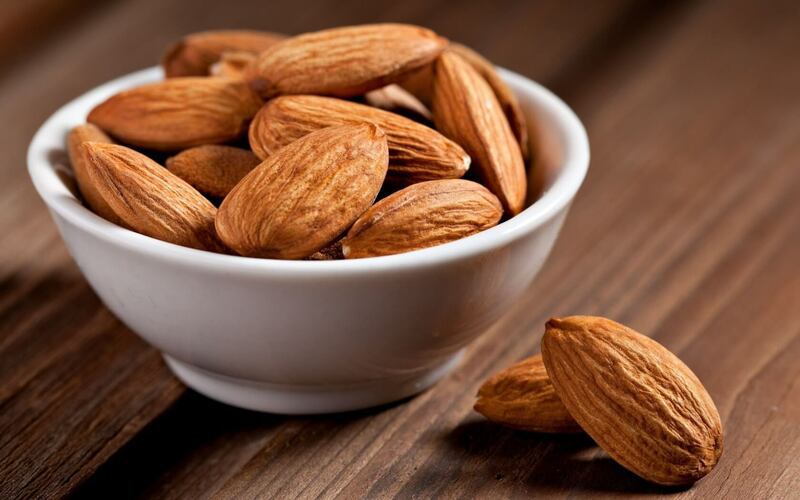 An age old recipe for a clear skin would be to soak almonds and peel the skin, grind it into a paste and apply as a face pack. There are various recipes that involve badam/almonds. The most simplest of them would be to dry roast and grind badam into fine powder and store them in an air -tight container. Add it to a simple glass of milk to enhance the taste. You also get these ready-made almond milk powder that can just be mixed with your daily glass of milk. A must for pregnant ladies and growing children. On special occasions, Indians often make the traditional badam kheer- a sweetened and condensed milk mixed with the goodness of ground badam paste. It is simple and quick to make and delights your guests! Badam is also added in some of Punjab’s traditional gravy based items. Soak a handful of badam and peel the skin and ground the paste. The thick paste adds a richness to many dishes and makes it lip-smacking. And when talking about almonds, how can we not discuss sweets?! Almonds are an integral ingredient in various sweets such as badam burfi, badam halwa, dry fruits halwa, dry fruits ladooo and list goes on! If you are under medication for any particular illness, you may want to check with your doctor before you suddenly indulge in almonds. Toss a packet of almonds during your next grocery visit and revel in its goodness. Happy Diwali! ← Health and Spirituality: Take a Leaf out of the Ancient Shastras!